As someone whom is part of several communities, and now being asked by companies to help build their communities, this is a topic I see firsthand. Having been invited to join so many communities, I have had to ask what the value is. This leads to being more selective on which communities I ultimately participate in. It is important to note that there is a difference between the value to a community member and the community organizer. The value equation must factor both and be bi-directional. In sum, all parties to the community must see value in their participation. In personal terms, a sense of community plays a key role in our societal interests and overall well-being. A community of individuals with similar interests is quite powerful in many ways. There is a saying that “It takes a village…(to raise a child)”. If said ‘child’ were a product, interest or company, the value comes from not just the product itself, but from the community built around the child. It is this very community that brings the true value to any product, interest or company today. In a business context, the community may include buyers, consumers and influencers. Today, there is quite a bit of discussion about “Influencer Marketing”. Understanding the authentic influencer and therefore their true value is much more complicated than just looking at some social media stats. Unfortunately, social media has provided a megaphone for anyone to use. Providing value to a community, like raising a child, takes more than just reading a book, showing up on a list or having an opinion. 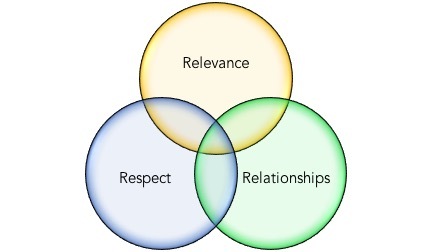 In my experience, there are three core components that drive the criteria: Relevance, Relationships and Respect. Communities are complex to understand. Communities are hard to build. Communities require constant care and feeding. The very definition of community ties back to sharing a common interest. The interest ultimately becomes the relevance to each individual’s specific situation along with that of the organizer. Relevance provides the common bond and interest between the parties. It provides a central rally cry that addresses a common, shared need or desire. Individual interest is not enough. An individual may be interested in a specific topic, but if is not something they are passionate about, it may be hard to keep their interest over time. Even if someone is passionate about a specific interest, do they have the capability to provide a significant impact. Interest does not equal expertise. Just because you have an opinion, does not make you an expert. Not-so-subtle message here: Reach does not equal Relevance. And like value, relevance goes both ways. What is in it for me and for them? Identifying individuals with a common interest provides a certain level of value. However, the true value is in knowing (and maintaining) the level of interest and influence of the individuals over time. What are the nuances that an individual brings to the community? These nuances often do not show up in a profile, post or list. How have those changed over time? Remember that we are talking about humans here..which are complex. The relationships span both community members and organizers. In addition, these very relationships will evolve over time. The relationship itself is not a binary thing. It will exist on many levels and take many forms. One would be remiss to talk about relationships and leave out mutual respect. Rather than talk about what respect brings, let us talk about the inverse. Simply put, without respect, a community does not work. During the course of conversation, opinions will differ. There needs to be a level of respect among the participants. Otherwise, there is a high likelihood the community will either disintegrate or worse, implode. Respect is not something that is freely given. It is something that is earned over time. It, like relationships, must be cared for. Respect is something that takes time to build and can be torn down in an instant. Each of these three core components directly tie back to the participants whether discussing relevance, relationships or respect. All three are essential to success. A community is not a one-time activity. The value of a community is the sum of the parts…over time. It has a lifecycle that goes through different stages of maturity. If you have reached this point asking how this differs from the complexities of building an organization…you’re spot on! But how does one go about building a community? And how does one ensure that the community will help the child…er…business flourish? Ahh… that is for another post. Great article Tim, and one of the many reasons I like to hang out with you…I learn a lot. Like you, talking from first hand experience, the value you have provided in the communities we have been on together has been huge…so I am delighted to see that you formalized your learnings and written them down in a blog, so others can lean from you also. Good job!! Thanks Chris for the kind words! I have tried to cover a number of the key points. However, as you know, the devil is in the details. Nor is this intended to be a prescriptive list of actions to take. There is much to learn about this space. Having seen it done from both sides from multiple companies and at varying degrees of maturity. I have learned what to (and not to) do.